An outdoor fireplace can transform an ordinary outdoor space into an attractive addition to your Wayne, Gilbertsville or Glenmoore home. Being able to entertain friends, adding square footage for family use, and the flickering flame of a fireplace can add value to your home and extend your outdoor season. Outdoor fireplaces come in all shapes, size, and styles and can complement any home style and definitely serve as an important focal point in your outdoor landscape design. We take pride in helping you choose the right outdoor fireplace in your Limerick home or surrounding areas. 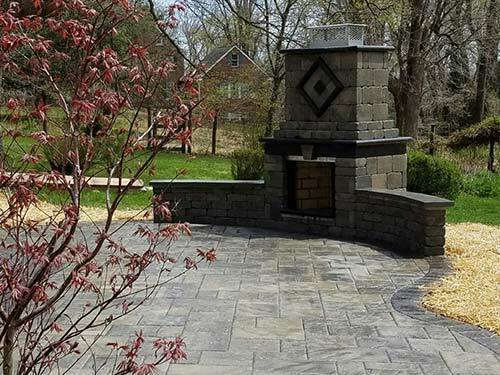 If you are a homeowner living in Montgomery or Chester county, and you are interested in having a fireplace designed and installed in your outdoor space, consider working with our experienced team. Let Whitehouse Landscaping start the design process and see how we can transform your property and make your backyard a go-to place for all four seasons.